Happy Spring! Looking at the Projects Calendar for April and May, we have events popping up everywhere. It’s our last push before the Annual Meeting next month. We have fashion shows, raffles, cabarets, luncheons and Buncos, just to mention a few. All of these events greatly support KV PEACe so I hope you can plan to attend a few of them. The final Member Meeting is Tuesday, April 2. I think you will be interested in the information presented by Dr. Sorter on anxiety and depression. We will also enjoy delicious food and door prizes. If you have not yet signed up, you are still welcome to attend. It promises to be a great evening beginning with a happy hour from 6:00 PM to 7:00 PM followed by our main speaker. The meeting will be held at Sabin Hall in Liberty Township. I hope to see everyone there! We also have our Annual Dinner coming up. Make sure you mark your calendars for May 15. Our dinner/meeting will be held at the Cincinnati Women’s Club. 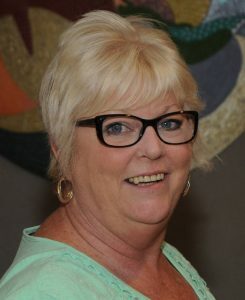 Pat Wahl is planning an exciting evening at which we will do the following: hear from the Division of Adolescent Psychiatry and KV PEACe, recognize members of 20, 30 and 40 years, present the Barbara Fitch Award, induct the 2019-20 Board of Trustees, and present the check to the Division of Child and Adolescent Psychiatry. Please try your best to attend this important evening. April is National Volunteer Month. I have never met so many dedicated, caring and hardworking women in my life. I’m so proud of each and every one of you, and I can’t thank you enough for your loving hearts. Thank you all for EVERYTHING you do for Kindervelt!